Labour's Margaret Hodge has attacked her party's shadow cabinet for accepting support from accountancy giant PricewaterhouseCoopers (PwC). Labour MPs - including Ed Balls and Chuka Umunna - have received more than £540,000 in research assistance from the firm in the past 18 months alone. 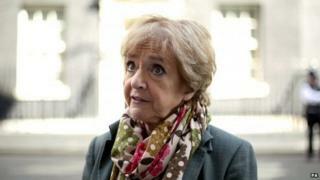 Mrs Hodge told BBC Radio 4's The World at One this was "inappropriate". The committee chaired by Mrs Hodge has accused PWC of "promoting tax avoidance" on an industrial scale. PwC said it disagreed with the Public Accounts Committee report and denied claims by Mrs Hodge that the firm had misled her committee when its executives gave evidence in January 2013. The company said in a statement that it had "no political affiliation" and did not make "any cash donations to any political party or other groups with a political agenda". But it added: "In the interests of the firm and its clients, we seek to develop and maintain constructive relationships with the main political parties". Labour's Shadow Work and Pensions Secretary Rachel Reeves currently has a PwC analyst working to support her who is paid at a rate of more than £500 a day. Mrs Hodge said this was arrangement was "inappropriate" and should end. The Barking MP told the World at One: "You have to be very, very careful when you're in opposition whom you take money from". She added that there needed to be "greater transparency and tougher rules" regarding secondments. The Public Accounts Committee report focuses on PwC's tax avoidance schemes, which are legal, but allow companies to divert profits to tax havens like Luxembourg via a series of loans between different parts of the business. A Labour Party spokesperson said: "PwC have provided long standing support to all three major political parties on a non-party basis, as happened for the Conservatives and Lib Dems before the last election. "Given the complexity of government and that opposition parties do not have significant access to civil servants, the support provided by organisations such as these helps ensure that there is better scrutiny of government policy. "Where organisations provide staff to support research and analysis for opposition parties it is right that these are declared - as currently happens - in the Register of Members' Interests." Declarations in the current register show Labour MPs have received more than £540,000 in assistance from the firm since September 2013. The Liberal Democrats have also declared nearly £450,000 in non-cash donations from the firm since 2010 with the Electoral Commission. PwC said its staff provided "limited and fully disclosed technical support to the main political parties" but added: "We do not develop policy on their behalf." Staff on secondment might make "observations on the improvement of legislation or proposed legislation", the firm added in a statement. Mrs Hodge was herself employed by PwC in the 1990s as a public sector consultant and still receives a "bit of a pension" from the firm, she told the World at One.